When figuring out the benefits of the mumps, measles, & rubella vaccine, you need to use evidence-based medicine, medical ethics, and shared decision-making. The official name of the vaccine in use in the United States is M-M-R® II, which I will abbreviate as MMR II. Interestingly, you can use the exact same data to be pro-vaccine or anti-vaccine (for this particular vaccine). It depends on the assumptions you make, and the ranges of the data points. Surprisingly, you have to make assumptions, because there are no adequate randomized controlled studies (RCTs). 6. The patient deserves complete transparency. I, (15-month old Olivia) try to make medical treatments understandable. Usually, you give me a diagnosis and I come up with a list of treatments for that diagnosis with Treatment Scores. One can see why it’s simpler to call it the “Treatment Score,” or the “net treatment benefit.” The Treatment Score is a way to summarize the “net treatment benefit” for the patient down to one number. I (baby Olivia) got tired of the fact that 88% of the population is health illiterate (Health.gov). For example, people do not understand that a chemotherapy can have a Treatment Score of zero, because that chemotherapy does not increase survival, which happens far more often than you would think. People also do not understand than an “alternative medicine” can have a Treatment Score of “no data,” because there are no clinical studies of human beings undergoing that treatment. Similarly, people often disregard all “alternative medical treatments” as being bogus, when in fact, sometimes alternative medicines do have good studies to support them. We need a solution to all the confusion. We need Treatment Scores. The diagnosis is “mumps, measles, and rubella prevention,” but we need to be more specific by making the diagnosis “mumps, measles, and rubella prevention in the United States.” Location turns out to be very important when it comes to risks and benefits. 1. Will the MMR II vaccine prevent me from dying? 2. 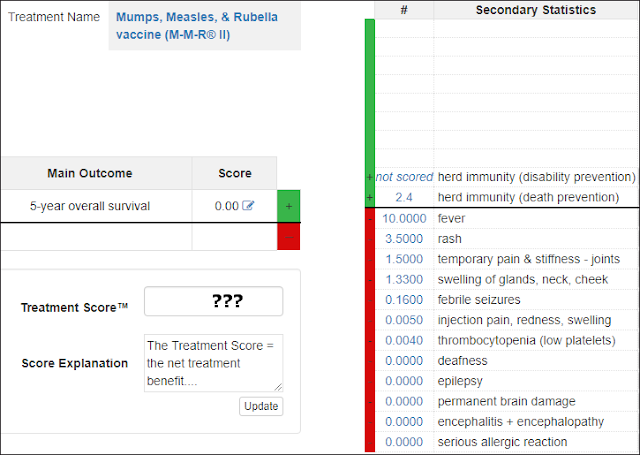 Will the MMR II vaccine prevent from me from suffering permanent disability from mumps, measles, or rubella? One treatment is to do nothing and suffer the “natural history” of measles, measles, or rubella if I should contract any of them. One treatment is to take a placebo (a do-nothing pill) and see if I have a “placebo effect” that magically prevents mumps, measles, or rubella. The treatment I am focusing on now is the MMR II vaccine. My last idea (as an unreal educated toddler) might be to look into any clinical trials that are being done on new treatments to prevent mumps, measles, and rubella. I will one day grow up to be a strong independent woman, so I am choosing the single most important outcome measure to me: overall survival. Specifically, I am choosing “5-year overall survival.” I want to know how much my “5-year overall survival” will increase if I take the MMR II vaccine. I want to know about “absolute” increases not “relative” increases, because it is easy to exaggerate, mislead, or outright lie with relative numbers. “When determining the optimal treatment choice based on the relative benefits and harms of a therapy, the values and preferences of each individual patient must be considered.” – Dr. Gordan Guyatt, et al. (Users' Guides to the Medical Literature: A Manuel for Evidence-Based Clinical Practice 3rd Ed. Page 71). “Five-year overall survival” is important to me because of “the measles situation.” Measles is the most likely of the three diseases to kill me. And, when measles kills kids, it mostly kills kids who are less than 5-years-old. “Five-year overall survival” is also a good choice because there is good data about the number of cases of mumps, measles, and rubella that have occurred in the last 5 years. I also like “5-year overall survival” as my main outcome measure, because it’s a standard time period in medicine when it comes to other diseases such as cancer. Imagine that someone does a randomized controlled trial (RCT), and some patients get placebo pills and other patients get chemotherapy. After 5 years 95% of the patients who got chemotherapy are still alive and 0% of the patients who got placebo are still alive. That 95% difference in 5-year survival is important. That treatment really works! One last reason to like 5-year overall survival is that there is a general body of medical literature about children from 0 to 5 years old (0 to 60 months). Remember, I am a fictional 15-month old toddler, who is precocious, brilliant, and highly educated. What will my 5-year overall survival be if take the MMR II vaccine? What will my 5-year overall survival be if I don’t take the MMR II vaccine? What will be the difference between the two? Eventually, I really want to know “lifetime overall survival” as well as 5-year overall survival, because mumps, measles, and rubella can affect the young, the old, and the unborn, but that analysis will have to wait for a future essay. There is an 88% health illiteracy rate (https://health.gov/communication/literacy/issuebrief/). One way to solve the health illiteracy problem is to summarize a medical treatment down to one number, the net treatment benefit for the patient, which I call the Treatment Score. In medicine, I often see statistics that do not put the patient first. What the patient needs to know is the net treatment benefit for them. I see all kinds of confusing statistics being given instead of what I (and you) really need to know, the NET TREATMENT BENEFIT. A great example of the change we (all of us patients) need is Sabermetrics. Sabermetrics was invented for baseball by Bill James. Sabermetrics basically says, “Dear baseball managers, you are using the wrong statistic. This is the statistic, you should be using: runs created.” This concept helped start a revolution in baseball. We need to do the same in medicine. We need to digest all the information down to one number, the Treatment Score, which is the net benefit for the patient. (Animations can be used to show ranges and uncertainty as necessary.) You should watch the movie Moneyball, starring Brad Pitt, which is about Sabermetrics. Gross income – expenses = net income. Gross treatment benefit – side effects = net treatment benefit. 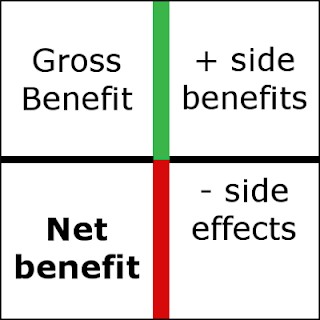 Gross treatment benefit + side benefits – side effects = net treatment benefit. I work in a clockwise direction. I find the “gross treatment benefit” and put it top left. I find the “positive side benefits” (green zone) and put them top right. I put the “negative side effects” (red zone) bottom right, and I calculate the net benefit at the bottom left. The net treatment benefit is what the patient needs to know. It is the most important statistic for the patient. It’s time to gather some statistics about the MMR II vaccine into the Treatment Score Calculator™ below. The main outcome measure, increase in 5-year overall survival (as a percentage) goes on the left, and the “secondary outcome measures” (also in percentages) such as positive side benefits” (green zone) and negative side effects (red zone) go on the right. This arrangement is the secret to understanding medical treatments. First, I organize the important statistics, and then second, I summarize them down to one number. We all need to do this for all medical treatments. We need to do this calculation using the medical literature, but also our own values and preferences. The main outcome on the top left is the same as the “gross benefit.” The top right is the “side benefits.” The bottom right is the “side effects.” The bottom left is the “net treatment benefit,” which is the same thing as the Treatment Score. Every statistic in the calculator is a percentage. The numbers on the right come from sources available to most people on the Internet. I (your fictional toddler) searched PubMed and Google Scholar. I looked at WHO, CDC, UNICEF and FDA data and tried to find the original sources. You need to double check my numbers and improve them whenever possible. For example, I know that the side effect rate of 0.005% for “injection pain, redness, or swelling” must be too low, but I can’t find a better source. People who do studies often ignore the “small side effects” so they don’t collect good information for us patients. But as a patient, I want to know about any pain or suffering a treatment will cause me. Maybe the true number is out there somewhere, but so far, I have not found it. Look around. Do you see anyone dying of mumps, measles, or rubella? You could say that the mumps, measles, and rubella vaccine is a victim of its own success. Two of the three diseases have been “declared eliminated” from the USA. Mumps was almost eliminated from the USA in 2000. There were only 338 reported cases in 2000. Measles was declared eliminated from the USA in 2000. Rubella was declared eliminated from the USA in 2004. The better a vaccine works the more the benefits seem to disappear. By almost eliminating mumps, measles, and rubella from the USA, the direct overall survival benefit seems to disappear for the individual patient. If you get vaccinated, your personal overall survival will not increase but by a very tiny fraction, because the diseases mostly don’t exist. The last confirmed measles death in the USA was in 2015. One infant died from rubella in 2012. 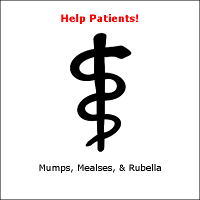 Catching the mumps can make you sick with fever, aches, pain, swelling of the salivary glands, tiredness, and headache. Rare serious side effects including deafness or encephalitis (inflammation of the brain) can happen. Catching measles can kill you. Measles can also cause diarrhea, ear infections, pneumonia, encephalitis, and seizures. Rubella causes pregnant women to lose their babies via spontaneous abortions or stillbirths (https://www.cdc.gov/rubella/about/in-the-us.html). Rubella also causes babies to be born severely disabled with congenital rubella syndrome (CRS). These babies can have deafness, heart problems, cataracts of the eyes, mental retardation, and premature death. Preventing death is the most important thing the MMR II vaccine can do. Herd immunity can protect our families and friends from death and disability, because we interact with them the most. It can also protect strangers and entire communities. There is no huge randomized controlled trial (RCT) that perfectly represents the value of herd immunity in preventing death. Instead there are lower quality studies, such as cohort studies, case-control studies, and survey studies. All such studies have flaws and biases. All survival studies need to control for the “improving nutrition” and “increasing standard of living” which occurs around the world, because those things also increase survival. We have to look for the most recent studies, but there are no perfect studies. The best available number for the increase in overall survival for the MMR II vaccine that I could find looked at the measles vaccine alone, as measles is the deadliest of the three diseases: mumps, measles, and rubella. I could not find good survival data for all three combined. How much have I (a toddler named Olivia) already benefitted from the herd immunity of the past 5 years? How much have I benefited in 5-year overall survival today due to the MMR II vaccine before it’s even my turn (to take it or not)? My preferred study for all-cause mortality found a 2.4 percentage increase in the probability of a child’s survival to 60 months due the measles vaccine (http://jhr.uwpress.org/content/50/2/516.abstract). So, 2.4% was the value I put in the calculator for the side benefit of herd immunity (death prevention). In the graphic above, think of the main outcome measure, the “gross treatment benefit,” on the top left as being in US dollars. Then, think of the negative side effects on the lower right as being in other currencies, such as pesos, euros, rupees, and rubles. The side effect statistics are “event rates.” It’s the rate that a side effect such as fever occurs in patients after taking the MMR II vaccine (hopefully compared to unvaccinated controls). When you go to a currency exchange, you convert one currency into another using the “exchange rate.” The exchange rate is different for every currency. The exchange rate “weights” the different currencies in order to exchange them into dollars. The same thing needs to be done with side effects to get them on the same scale as the main outcome measure. Once converted, the negative side effects can be subtracted to get to the net treatment benefit, which we call the Treatment Score. The medical literature suggests that there is a 10% chance of getting a fever after the MMR II vaccine. Our main outcome is “5-year overall survival.” How do we get the side effect of fever on that scale so we can subtract it? Sometimes we can use data from studies, and we should always ask the patient. This type of thing is done in medicine - side effects are converted into things called “quality-adjusted life-years.” It’s just not done often enough, and too often the patient’s opinion does not count, but it should, because your personal opinion may be different than the average person’s. My personal opinion is that getting a fever after an MMR II shot is not a huge negative, because it’s temporary, and can be treated. Getting a fever is “weighted” very low in terms of converting it as a side effect to be subtracted from 5-year overall survival. Five years is 60 months; 60 months is 1,825 days. I just roughly calculated that, for me, with my weighted conversion, this would only be like losing 20 minutes of survival from 5-years (43,800 hours) of overall survival. Getting a febrile seizure after the MMR II vaccine is more worrisome to me. I ended up putting the event rate at 0.16% (https://www.ncbi.nlm.nih.gov/pubmed/15265850) into my calculator. That means about 1.6 kids out of 1,000 will have a febrile seizure. Getting a febrile seizure is worse to me than just getting a fever, so I will weight it more heavily, using my values and preferences, and subtract this negative side effect from the gross benefit of the MMR II vaccine. Epilepsy is scary. A percentage of children get a fever. A percentage of those children have a febrile seizure. And, a percentage of those children go on to have epilepsy (seizures for life). In theory, this stair-step of complications can occur after measles, or can occur after the measles vaccine. The measles vaccine is a live attenuated vaccine, so getting the vaccine is sometimes like getting a weak case of measles. The studies I used placed this possible side effect of the MMR II vaccine at less than 1 in a million, so it shows up as zero in our calculator (we may need to fix this rounding in future versions). Any child who might be predisposed, or at genetic risk for fever, febrile seizures, or epilepsy should have special consultation before getting the MMR II vaccine. A DNA test is reportedly in the works to test for this tendency. The bottom right of my calculator contains some potentially serious side effects of the MMR II vaccine that are so rare they round to zero. They are things like: deafness, epilepsy, brain damage, encephalitis, encephalopathy, and serious allergic reaction. They are especially rare if your control group is children who do get mumps, measles, and rubella instead of your control group being simply unvaccinated children. Does the MMR II vaccine cause autism? Maybe. Maybe not. One study, retrospective cohort study, of 537,303 children in Denmark (http://www.nejm.org/doi/pdf/10.1056/NEJMoa021134) did not find a higher rate of autism in children who got vaccinated for mumps, measles and rubella. 1. Former British gastroenterologist Andrew Wakefield; Family Medicine physician Rachael Ross, MD, PhD; Pediatrician Jim Sears, MD; and CDC whistleblower Dr. William Thompson. They are all in the movie, Vaxxed. Because the side effect of autism is so hotly debated, I did not add it into my calculations. I dived deep into several studies and still did not feel certain about an “event rate” for autism. But, if in your review of the medical studies, you have found a number that you believe is accurate, you can add it into the calculations. That is the beauty of calculating the “net treatment benefit” using the patient’s own ability to understand science, and the patient’s own values and preferences. You can make calculations yourself. You can then assess the risks and benefits with your physician. This essay is a flawed first attempt to quantify the net treatment benefit for the patient from the MMR II vaccine as a Treatment Score, but it is the future. There is a lot of uncertainty in the numbers, because vaccine studies are usually not the Gold Standard: randomized controlled trials, but rather are lesser quality cohort studies, case-series studies, and survey studies. Researchers are learning from the past; however, and are doing better, and larger, studies over time. Yet, the fact remains that there is uncertainty in all the underlying numbers. There is disagreement about death rates (how often people die if they get one of these diseases) and in the negative side effect rates from the MMR II vaccine. The MAJOR POINT is that the numbers should be shared with you, and you should decide step-by-step with your physicians and nurses, which numbers come from the most credible sources. You should be able to calculate the net treatment benefit using your judgement by doing shared decision making with your doctors and nurses. That is how to do true informed consent. Part of medicine is dealing with missing data, biased data, and low-quality data. “They therefore involve value and preference judgments, and it is the preferences of the individual patient that must drive the decision. When the trade-off between desirable and undesirable consequences is a close one, the best—some would argue the only—way to ensure the chosen course of action is right for the individual is through shared decision making.” - Dr. Gordon Guyatt, et al. Users' Guides to the Medical Literature: A Manuel for Evidence-Based Clinical Practice 3rd Edition. Page 83. Because of the assumptions, uncertainty, and biases in the numbers, and the difficulty in doing the “net treatment benefit” analysis this first time around, the lesson of this essay is not the specific Treatment Score, but the techniques we all need to start using to figure out the net benefits of medical treatments. MEDICAL ETHICS - WHO HOLDS THE CARDS? Who decides the ethics? Obviously, the patient does. It’s the patient's life at stake; it’s the patient's health that is at risk. The Hippocratic Oath and the Nuremberg Code put the patient first. Decisions need to be made between the patient and physician with complete transparency: price transparency and product transparency. Product transparency means using patient-centered outcomes. Transparency also means figuring out the net treatment benefit for the patient using shared decision-making. Medical ethics says playing God is bad. Patients’ values and preferences must be considered in order to be ethical. The Greatest Generation was sometimes paternalistic to patients, because there was no Internet. Patients were like children, totally dependent on doctors for their medical information. Paternalistic medicine was bad, because in the old days, mostly male doctors were telling patients what to do. This resulted in the epidemic of unnecessary hysterectomies for example. After the Internet, paternalistic medicine underwent a shift. Instead of the individual physician telling the patient what to do, groups with “authority” and groups with “eminence” started telling physicians what to do, and then physicians told patients what to do. It became paternalism one-step removed. Once again, patients were left out. The reasoning for this “group type” of paternalist medicine was that, despite having information on the Internet, you, the patient, were felt to be incapable of understanding medical information. Experts with authority and eminence decided they must make medical decisions for you. This gave rise to “guidelines” or “conventional wisdom” provided by authorities and eminent people. Authorities and eminent people told the doctor what to do, and then the doctor told you what to do. Because unbiased randomized controlled trials (RCTs) are hard to do, we sometimes rely only on authority figures and eminent people using low quality studies. This probably led to a recent epidemic of unnecessary shoulder surgeries. The reaction to “authority-biased medicine” and “eminence-biased medicine” is that patients, doctors, and nurses should be doing shared decision-making with better transparency for all. It’s a new world. I (toddler Olivia) am growing up in a STEM world. I will grow up to be independent, smart, and capable. I will utilize the best information in conjunction with the smartest doctors and nurses I can find to make my own medical decisions. My generation will help democratize medical science. I study the Conflict of Interest Declarations at the bottom of medical studies, as have my parents before me, and my grandfather before that, and we have noticed something very important. Conflict of Interest Declarations are self-delusional. Conflicts of interest are caused by money or power. The money can be direct or indirect; it can be cash or it can be goods or services. Therefore, money or power need to be disclosed whether they come from Academia, Government, or Industry. Those three entities: Academia, Government, and Industry are sometimes called the Triple-Helix, as in a medical ethics book entitled: Trust and Integrity in Biomedical Research: The Case of Financial Conflicts of Interest (Edited by Thomas H. Murray and Josephine Johnston. The Hastings Center. New York, 2010). Search those phrases and you will find millions of examples. Medical ethics are clear that conflicts of interest in medicine are caused by three entities (in alphabetical order): 1. Academia. 2. Government, and 3. Industry. Academia is biased because they must “publish or perish,” defend the status quo, succumb to peer pressure, and so on. Government is biased because politics come into play, and because Governments are extremely powerful. When governments make a mistake, those mistakes can be huge. Need I mention the Tuskegee experiment, or later Tuskegee-like experiments? Industry can be biased because companies need to make money to survive. Almost every author’s declaration should at least say, “I have directly or indirectly been influenced by Academia, Government, or Industry.” Most declarations should be more specific and should add details that go back over the entire lifespan of the author. “Bias begins at birth” according to many medical studies. Essentially, we have the blind leading the blind when it comes to medical statistics and medical treatments. We need to put patients first and fix this. We need to focus on the net treatment benefit for the patient. We need perspective. We need to know the “net treatment benefit for the patient” and we need to be able to see it. On the scale that is important to you, the patient, is the treatment near 0% or is it near 100% in terms of net benefit to you? “The best interest of the patient is the only interest to be considered….” - William J. Mayo, M.D. – oldest Mayo brother, and one of the founders of the Mayo Clinic. Gross treatment benefit + positive side benefits – negative side effects = the net treatment benefit. In the future, I want each step to be transparent to you. I want you to be able to verify every statistic and its source. That would be true shared decision-making. I am leaving the final Treatment Score blank for now. Vaccines are not like other medical treatments, for which it is much easier to figure out the net treatment benefit. Vaccines have side benefits of herd immunity preventing death, and herd immunity preventing disability, which are hard to put a number on. Your personal values regarding herd immunity are very important. In addition, there are more assumptions, uncertainties, and biases present in the studies I have reviewed to be comfortable summarizing the data down to one number (yet). It is much easier with other medical treatments, because it is easier to convert everything to be on the same scale, to have data from the same time period, and to be from the same geographic location. There is more objectivity with other medical treatments. The benefits of a vaccine are a moving target. When mumps, measles, and rubella are epidemic in a community killing people, and disabling people, it’s easier to see the benefits of the vaccine. As more and more people are vaccinated, the risks of death and disability go down. Eventually, as the vaccine causes death and disability to approach zero, the only damages left to see are the complications of the vaccine. Then, it becomes a tragedy that the disease wasn’t wiped off the face of the Earth, like smallpox was, because even a 1 in a million complication is too much. Vaccines have diminishing returns. SHOULD YOU GET THE MMR II VACCINE? Should you get the MMR II vaccine? I would not presume to tell you what to do. I’m not going to decide for you, because it's up to you. You have to look at the data yourself and use your values and preferences to decide together with your physician. That's how evidence-based medicine, medical ethics, and shared decision-making work. I’m not going to be paternalistic. WILL I GET THE MMR II VACCINE? I already got the MMR II vaccine. It hurt my arm, but otherwise I was fine. I was essentially an average patient. Most importantly, I understood the science because it was well organized. Using my values, my assumptions, and the best data I could find, after adding it all together, it appears the net treatment benefit is around 3% in terms of increasing 5-year overall survival. 3% more kids alive is a great thing. This is deeply flawed essay, because the underlying data is from cohort studies, case control studies, and survey studies. These are low quality studies that can be subject to bias and confusion. This essay is a step in the right direction, and it will be rewritten and improved upon. This will not be the final version. In addition, I am biased to be pro-vaccine, because of the influence of “authority bias” and “eminence bias.” I tried to set my biases aside and be perfectly logical, using numbers only, but I felt my bias, because when I did calculations showing that vaccines were not as beneficial as I had imaged, I felt bad about it. It really is confusing that vaccine benefits are a moving target. Perhaps the bottom line is that we need to keep making vaccines safer and safer. “The design and reporting of safety outcomes in MMR vaccine studies, both pre- and post-marketing, are largely inadequate. The evidence of adverse events following immunisation with the MMR vaccine cannot be separated from its role in preventing the target diseases.” – V. Demicheli, et al. “Vaccines for measles, mumps and rubella in children.” Cochrane Database Syst Rev. 2012 Feb 15;(2):CD004407. In the future, we will put patients first. As others have said, you are not a statistic; you are a human being. In the future, we will actually do evidence-based medicine and shared decision-making. Doctors and nurses will help patients organize the medical literature and summarize the most important treatment statistics for their disease. “An important patient right is informed consent. This means that if you need a treatment, your health care provider must give you the information you need to make a decision.” – U.S. National Library of Medicine. It’s frustrating! The entire medical system should be geared toward figuring out the “net treatment benefit” for the patient, but sadly it is not. Let’s change this. What would really would be helpful would be a credible group of patients, doctors, and nurses, who put patients first, who are not working for Academia, Government, or Industry (or who declare their bias when they are), who produce Treatment Scores that are done transparently. That way we all would not have to spend countless hours trying to understand medical treatments, and we could begin to solve the 88% health illiteracy problem. I (Olivia, the fictional toddler!) asked questions of several experts in order to write this essay. I am thanking them here, but this does not mean that they approve of this essay or its methods. I am not mentioning names, because vaccines are a controversial subject. All the errors, misinterpretations, and assumptions are mine. This essay is only a small step in right direction of providing better treatment transparency for all. Treatments Scores, Inc. and associated individuals do not claim to diagnose, cure, treat, or prevent any disease. Treatment Scores are an educational system to help you figure out the science of medicine behind treatments, which should be the starting point for shared decision-making. The information on this website should never be used as a substitute for the advice of a qualified, licensed physician or healthcare professional. We are not advocating any treatment, physician, medication, or any other entity. We are informational or educational only. We do not form doctor-patient relationships. Contact your physician for medical treatment. Call 911 if you may have an emergency or go to the Emergency Department. We are not responsible for any delays in care from information obtained from our site, nor for any consequential damages of any nature whatsoever, either directly or indirectly related to the use of this site, or from assumptions made. We cannot predict the future, we are only trying to do a better job of quantifying and reviewing what has happened in the past. We claim ZERO accuracy. We claim zero accuracy, because in medicine every patient is different, every statistic is a flawed statistic in some way, there are always estimations, and there is always bad or missing data. Averages may be used and no patient is average, every patient is unique. We make no promises or warranties whatsoever. ALWAYS SEE YOUR OWN PHYSICIAN FOR DIAGNOSIS AND TREATMENT.